Gritty comes ziplining down to the field prior to the 2019 NHL Stadium Series game at Lincoln Financial Field in Phila., Pa. betewwen the Philadelphia Flyers vs. Pittsburgh Penguins on February 23, 2019. 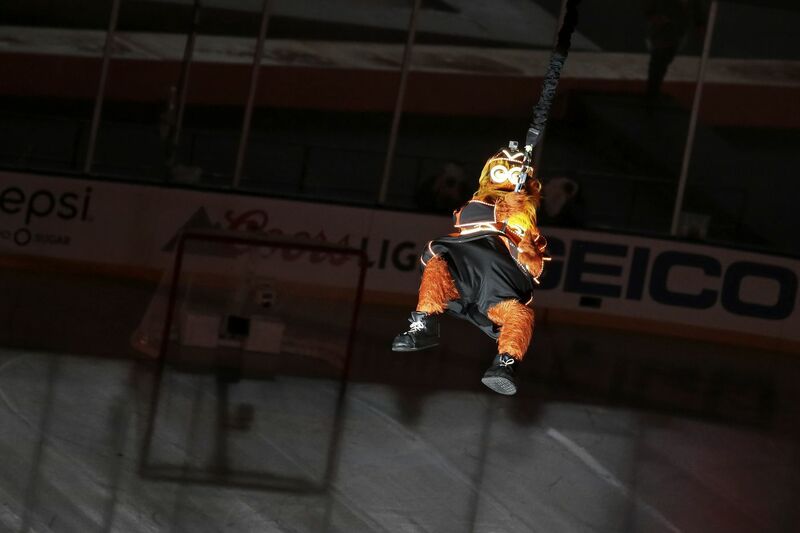 If you didn’t think Gritty was going to make a special entrance ahead of the Flyers’ Stadium Series game against the cross-state rival Pittsburgh Penguins, you don’t know Gritty. So what happens for sports bettors if the Flyers-Penguins Stadium Series game gets called early? It was reminiscent of his Wells Fargo Center introduction, when he came down from the ceiling like wrecking ball. The Flyers mascot was joined by other athletes in the city, including newly acquired Sixers Tobias Harris and Boban Marjanovic, Flyers great Bobby Clarke, Eagles center Jason Kelce, and former Phillie Jimmy Rollins. Eagles coach Doug Pederson dropped the ceremonial first puck. No current Phillies, including whoever runs the team’s social media account apparently, could attend the game since the team is in the middle of Spring Training down in Florida.